Environmental education, sustainable community planning, development and sustainable future in Pacific rural communities. Environmental education program areas include: Water, sanitation and hygiene, sustainable use of biodiversity, environmental governance and natural resource conflict management. We also focus on training programs for climate change and sustainable energy options, waster reduction management and disaster prevention. 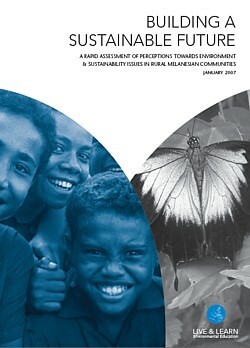 NOTE: This Environmental Education report focuses on our work in Fiji, Cambodia, Vanuatu, Solomon Islands, Australia. The Rapid Assessment of Perceptions (RAP) was undertaken in rural communities in Vanuatu, Papua New Guinea, Solomon Islands and Fiji. In examining environmental issues related to health, making a living and culture, RAP participants articulated a wealth of detailed information concerning their perceptions of problems, decision making, hopes for the future, and community organisation and capacity. The RAP revealed that there is a wide diversity of issues that concern community members that are specific to each community. However, the RAP also showed that the four countries share similar issues of concern. The issues most consistently perceived to be urgent and important were water and sanitation, loss of culture, rubbish, land ownership (and disputes), health, uncontrolled animals and unsustainable exploitation of natural resources in-order to gain money (e.g. cash cropping and forestry). In general, communities were able to communicate a good understanding of the connectivity between social, economic and environmental issues. The assessment of capacity to engage in sustainable development activities found that communities have been previously involved in few environmental initiatives, or initiatives that are relatively small in scope. However communities felt that they had good human resource capacity to take part in initiatives, particularly through existing groups such as churches and local government. Key barriers included resource constraints (financial and material), lack of motivation and the unwillingness of clan or ethnic groups to work together. Motivation was perceived to be strongly linked to financial incentives. The surveys of decision making power and influence in communities typically showed that a small number of people in the community have the majority of say over many decisions, particularly the key issues of land use. Generally, women and youth are not well represented in decision making. The influence of Government was variable being higher generally in Vanuatu and Fiji than in Solomon Islands and Papua New Guinea. This report provides a framework for considering the findings of the RAP and the methodology of Education for Sustainable Development (ESD) in the design of sustainable development programs for rural communities. The educational approach developed in Building a Sustainable Future should therefore entail more than developing personal attributes to deal with immediate environmental challenges, it should also seek to arm individuals and communities with the means to critically examine and influence the social structures that fundamentally affect their lives. Page Sponsors: Protect your home environment with termite treatment and pest control Melbourne and Australia. Solar panel Perth installers helping our environment. Education? We don't think so. Say No make objections to Narconon in Warburton. We would like to acknowledge and thank each of the communities involved: their enthusiasm and willingness to give their time to participate in discussions was greatly appreciated; the tireless efforts of the field research officers in each country (see below); Christian Nielsen, Live & Learn Director; and Jady Smith, Hazel Clothier and Fathimath Shafeega who pioneered the RAP methodology through the Live & Learn Maldives program.